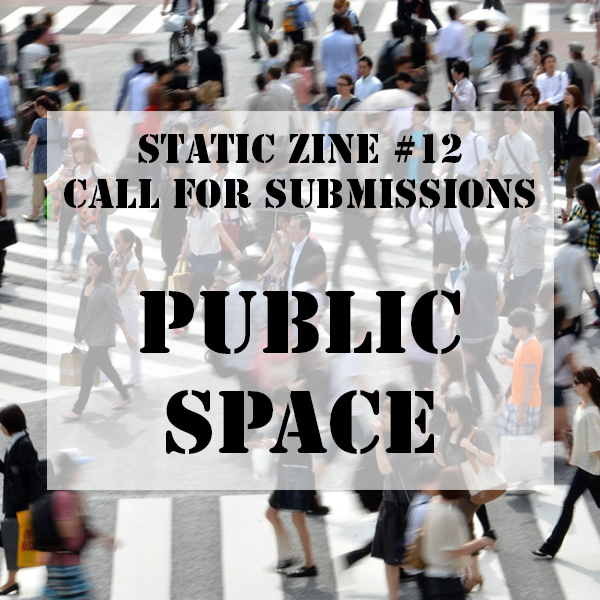 Issue 12 – PUBLIC SPACE – Call for Submissions! Issue 12 is coming! The theme is public space! We are looking for submissions (we are skipping the pitch round this time) of writing and illustrations or any way you can design a page. So, what about public space? Really, anything! We welcome pages on how you feel in public, an issue you may have with a broad or specific area, your favourite park, a lecture on dogs pooping on the sidewalk, a rant about how people stand on escalators, gendered washrooms, the need for safe spaces, accessibility, common courtesies, the relationship between public space and anything really (politics? activism? concerts? ), hidden spots, where to go for a good cry while out, etc. The world is your oyster! What we’re looking for: One zine page, please! Your full submission. Whether it’s an idea for something serious, witty, funny, opinionated, you name it. You can come at the idea through any kind of word or art interpretation. Anything that works, printed on a sheet of paper. Common uses in our zine include personal stories, fiction, illustration, photo collages, game designs, comics, doodles, etc. Feel free to combine! How to submit: Email your page to info@staticzine.com. Deadline: Thursday, October 8, 2015. We have low tolerance for late submissions, and it takes us time to put everything together and get printed, so please take this seriously.